Home › What Happens in Al-Anon Meetings? Al-Anon is a 12 step support group for the families of alcoholics. You can attend Al-Anon meetings even if the alcoholic in your family is not in Alcoholics Anonymous. The sense of community, family, and understanding helps many families cope with the stresses of having a family member who is an alcoholic or recovering alcoholic. The point is to get you out of the traditional role of victim or enabler and move towards a better future. Many people wonder what happens in these meetings. Call 800-839-1686 toll free anytime for help finding treatment for addiction. According to the American Bar Association, Al-Anon and other 12 step meetings usually start on time. Very rarely do they start late. Schedule is usually important to the average Al-Anon or Alcoholics Anonymous member. The person who has agreed to be the chair or leader of the meeting will call the meeting to order. He or she will also ask if there are any new members or out of town members. The purpose of this is to welcome them to the group. New members might receive hugs and “keep coming back,” chips. The chair will usually lead the group in the serenity prayer. This is a standard prayer for most of the Alcoholics Anonymous groups including Al-Anon and Alateen. The chair at this point also sometimes recites the 12 steps and the 12 traditions. In Al-Anon meetings people often take turns speaking about their experiences. Open meetings – anyone is welcome in these meetings including therapists, students, and friends. These meetings usually have a topic that the chair opens for discuss after the welcome and the serenity prayer. In an open meeting most people are aware that others might be there so many are not as prone to sharing as others. Closed meetings – these meetings are for Al-Anon members only. After the prayer the chair introduces a topic and everyone shares their thoughts on that topic. Step meetings – In step meetings the topic is one of the steps. Everyone shares his or her thoughts on the step in question. These meetings can help you understand the overall Al-Anon philosophy. Speaker meetings – in this type of meeting no one shares except for the speaker. The speaker tells their whole story in the hopes that others gain insight and perspective from it. This is so you can hear the struggles of others and learn from them. Beginner meetings – these meetings are for welcoming newcomers. There is no specific sharing as there is in normal meetings. This is for what cross talk. People have conversations and it allows newcomers to learn about the basic principles while in a warm inviting atmosphere. It is important to remember that beginners are welcome to any meeting in any format. The different formats are not to discourage people from going to meetings. They do not have to wait for a beginners meeting to attend. At the end of an Al-anon meeting, the chairperson either reads or makes closing remarks. There might also be a closing prayer. After the meeting, most people enjoy snacks and conversation with each other. The majority of the meetings end exactly on time. Most people are friendly and will answer any questions about the meeting that you might have. Most people initially fear speaking at the meetings. All of the publicity behind Alcoholics Anonymous and 12 step programs show people sharing their stories and talking to the group. This is not always the case. You are not pressured to share. Although the group takes turns sharing, you do not have to. There is no requirement that you speak. All you have to say is your first name and that you just want to listen. Because of the nature of these meetings, this is enough. Part of the attraction to Al-anon is that you are with people who have been there. Not only do they know what you are going through with an alcoholic in your life, they know what it is like to attend a first meeting. They understand what it is like to be among the group for the first time. One thing that people do not find is pressure at these meetings. Who Benefits from Al-Anon Meetings? anyone who is in close contact with an alcoholic. Pretty much anyone who needs help dealing with the alcoholic in their life will benefit from attending Al-anon meetings. These meetings provide help, hope, and community to those who are in need due to another person’s alcoholism. Al-Anon meetings are relatively easy to find. Most churches have a chapter of Al-Anon as do most community centers. The meetings are posted on bulletin boards, the internet, in flyers, and in most counseling offices. Many rehab facilities also offer Al-Anon meetings for the family members of their patients. 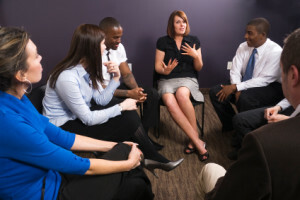 According to the National Institute on Alcohol Abuse and Alcoholism, family and friends who attend community based support groups such as Al-Anon, are better equipped to handle the problems with Alcoholism. When you learn to cope with the stresses of having an alcoholic friend or family member it also helps the Alcoholic onto the path of recovery.